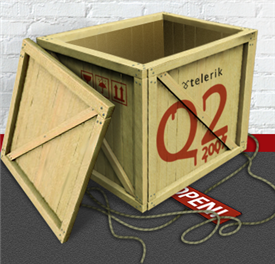 We have finally put enough people on the Telerik Q2 scale to raise the Q2 release! Thanks to everyone who contributed their weight to the game and helped us count down to the Q2 2007 release. Now that the game is over, you can jump over to the game page and browse through the highlights of Telerik's second major release for 2007. Have fun reviewing all of the new things that will be shipping early next week- the wait for the great new controls like RadScheduler and RadGrid 5 is almost over. And as I promised, there is one "secret" that we finally revealed today: Telerik Labs. Built with Silverlight, Telerik Labs is where you can go to see previews of some our latest development efforts. This new location is going to become a permanent fixture in the Telerik universe, so expect to see frequent updates to labs.telerik.com that showcase early previews in the future. Labs is built entirely with Silverlight 1.1 (so you'll need the alpha plug-in) and it showcases some of Telerik's work in the yet-to-be-previewed RadControls for Silverlight 1.1. Hopefully you'll enjoy this new resource and have playing with the site. So there you have it. Q2 in (and now out of) a box. Enjoy your weekend browsing some of the new demos and tune-in next for all of the release activity.